Bringing the wisdom and spirituality of thousands of years closer to you. Elohai Neshama אֱלהַי נְשָׁמָה Just as God restores our souls to us each day after sleep, God will someday restore our souls to us in the world-to-come. Kaddish קַדִּישׁ The conclusion of each section of the service, we declare “The Eternal One is holy!” even in the midst of mourning. Psalm 30 'תְּהִלִּים פֶּרֶק ל A psalm of praise to the One who turns our mourning into dancing. Ashrei אַשְׁרֵי Let every single letter of the alphabet find a way to praise the Eternal One! Maariv Aravim מַעֲרִיב עֲרָבִים We marvel at the wonder of creation as we praise Adonai, whose word brings on the evening. Yotzer Or יוֹצֵר אוֹר Just as God renews each day the work of Creation, so can we begin a new and better life every single day. Ahavat Olam אַהֲבַת עוֹלָם God expressed love for us by giving us Torah; we express our gratitude for that love in the prayer Ahavat Olam. Ahava Raba אַהֲבָה רַבָּה Through the gift of Torah we learn to bring our lives into harmony with the immutable laws of the universe. Shema שְׁמַע An expression of one of Judaism’s most central ideas - the unity and oneness of God. Veahavta וְאָהַבְתָּ Just as we thank God for showing love to us through Torah, we express our love for God by embracing it. Parashat Tsitsit פָּרָשַׁת צִיצִית We are reminded of God’s commandments by wearing and looking upon the fringes—the tsitsit. Mi Chamocha מִי כָמֹכָה We sing praises to God for redeeming us from slavery and injustice as we wait for God’s ultimate redemption. 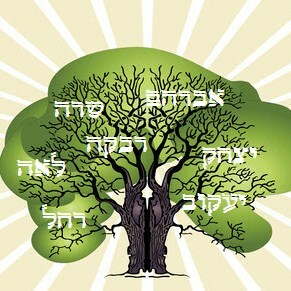 Veshamru וְשָׁמְרוּ After the six days of physical creation, God found gave the world a soul by creating Shabbat. Avot v'imahot אָבוֹת וְאִמָּהוֹת This first prayer of the central section of every service reminds us that we worship the same God as did our ancestors. Gevurot גְּבוֹּרוֹת The Gevurot is a declaration that God has the absolute power to accomplish that for which we pray. Kedushat HaShem קְדֻשַׁת הַשֵּׁם An expression of reverence for God’s ineffable holiness and our aspiration to reflect that holiness in our lives. Kedushat Hayom קְדֻשַׁת הַיּוֹם We reaffirm the holiness of Shabbat and ask God to grant us purity of heart and unblemished rest. Yismechu יִשְׂמְחוּ Yismechu reminds us that observance of Shabbat is not a burden but rather a source of joy and delight. 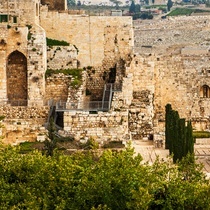 Avodah עֲבוֹדָה We are reminded of the sacrifices in the Temple of old and we offer in their place our words and our deeds. Modim Anachnu Lach מוֹדִים אֲנַחְנוּ לָךְ This prayer comes to remind us of God’s continuing miracles, which we must never take for granted. 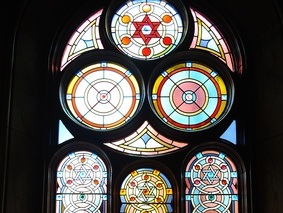 Shalom Rav שָׁלוֹם רָב In every afternoon and evening service, Shalom Rav is our prayer for wholeness, completeness and peace. Sim Shalom שִׂים שָׁלוֹם The prayer found in every morning service in which we ask God for the spiritual blessings of peace. Taking out the Sefer Torah הוֹצָאַת סֵפֶר תּוֹרָה With these prayers, the Torah scrolls are lovingly taken out of the Holy Ark and paraded around the synagogue. Torah Blessings בִּרְכוֹת הַתּוֹרָה Members of the congregation are given the honor to chant these blessings before and after the Torah is read. Haftarah Blessings בִּרְכוֹת הַהַפְטָרָה A reading from Nevi-im--the books of the prophets--supplements and “completes” the Torah portion of the week. Mi She-beirach La-Choleh מִי שֶׁבֵּרַךְ לַחוֹלֶה In an outpouring of the spirit before the open Ark, the congregation prays for the healing of those who are ill.
Birchat Ha-chodesh בִּרְכַת הַחֹדֶשׁ On the Shabbat prior to the beginning of each Jewish month, this prayer invokes God’s watchful care upon us. Returning the Sefer Torah הַכְנָסַת סֵפֶר תּוֹרָה As we return the Torah scrolls to their home in the Ark, we ask Adonai to return us to our home in God’s care. Ein Keloheinu אֵין כְּאלֹהֵינוּ Often chanted each week by the congregation’s children, Ein Keloheinu reaffirms that there is no one like Adonai. Aleinu עָלֵינוּ Originally from the Rosh Hashanah morning service, Aleinu is now a part of every service of the year. Hadlakat Neirot Shabbat הַדְלָקַת נֵרוֹת שַׁבָּת We welcome the Shabbat with the lighting of candles as a reminder that Shabbat is a time of light and joy. Birchat hayeladim בִּרְכַת הַיְּלָדִים As the Shabbat enters, parents bless their children--even the grown ones--who then bless their own. Shalom Aleichem שָׁלוֹם עֲלֵיכֶם Tradition tells us that two ministering angels accompany us home from the synagogue as Shabbat begins. Eshet Chayil אֵשֶׁת חַיִל Though today’s Woman of Valor is different from the one described in Proverbs, certain qualities are timeless. Kiddush for Erev Shabbat קִדּוּשׁ לְעֶרֶב שַׁבָּת We are reminded of Creation and the Exodus from Egypt as we proclaim the sanctity of Shabbat over a cup of wine. Hamotzi הַמּוֹצִיא Hamotzi begins every meal with an expression of gratitude to God and an anticipation of Messianic times. Tzur Mishelo צוּר מִשֶּׁלּוֹ We sing joyfully at the conclusion of the Shabbat meal songs that celebrate Shabbat (zmirot). Lighting Hanukkah Candles הַדְלָקַת נֵרוֹת חֲנֻכָּה Hanukkah reminds us that it’s better to light candles than to curse the darkness and that freedom is worth fighting for! Kadesh Urchatz קַדֵּשׁ וּרְחַץ The Passover Seder has a prescribed order... the word "seder" itself means order, and here's where we spell it all out. Ma Nishtana מַה נִּשְׁתַּנָּה Why is this night different from all other nights? The Passover story unfolds as we seek the answers to the Four Questions. Tefilat HaDerech תְּפִלַּת הַדֶּרֶךְ The Traveler's Prayer is a prayer for a safe journey - both on the actuall road as well as on our spiritual journey of life.